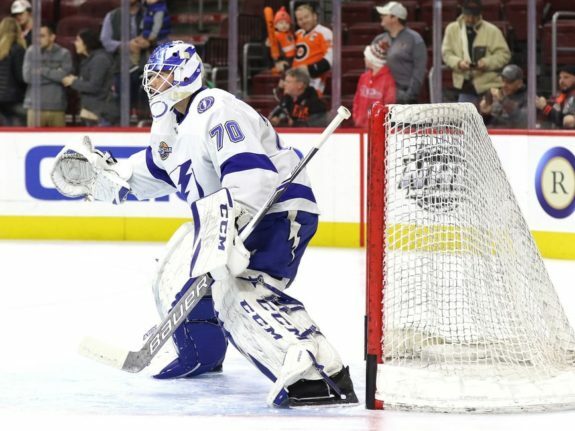 There’s no question that Andrei Vasilevskiy is the Tampa Bay Lightning’s No. 1 goaltender. 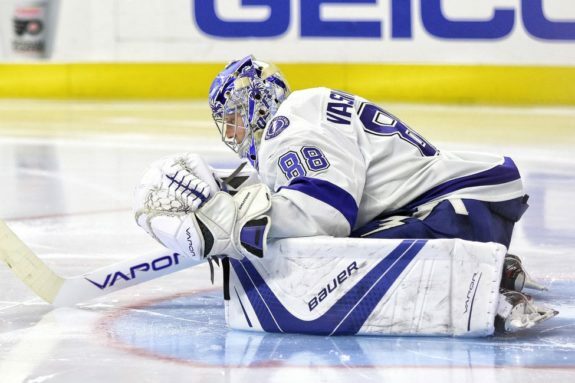 He finished third in Vezina Trophy voting in his first full season as a starter in 2017-18 and if it wasn’t for a below average second half, ‘Vasy’ might been named the league’s top goaltender. Backing up Vasilevskiy in 2018-19 will be Louis Domingue who, after being traded from the Arizona Coyotes, found his form as a backup. The tandem should provide the Lightning with another season of solid goaltending, but let’s take a deeper look into the numbers and how the two netminders compliment one another. Lightning goaltending coach Franz Jean said that he wants Vasilevskiy to play between 55 and 65 games, and for good reason. Vasy was tied for fourth in games played and tied for the league lead in wins, but his rough stretch at the end of February and beginning of March can be attributed to his first real workload as an NHL starter. In the previous three seasons combined, he played 81 games, only 16 more than all of last season. Getting him a few more off days and rest will be extremely beneficial to a young goaltender who they expect to start every playoff game this season. If Vasy can get in between 55 and 65 starts, his numbers late in the season should be much better than last season, especially considering he’s got a full NHL season under his belt. At 24 years old, he is one of the top young goalies in the game, but the Lightning need to be cautious of overusing him. He found his groove at the end of the season and in the playoffs, but to avoid stretches of inconsistency, he will need rest. That’s where Domingue fits in, just as he did last season. Domingue had a 7-3-1 record with a .914 save percentage and 2.89 goals-against average (GAA). If Domingue can repeat those numbers but in seven or eight more games, the Lightning will be strong in net. Vasilevskiy led the league in power play goals against with 44, but the Lightning also had one of the worst penalty kills in the league last year. The Bolts relied on their goaltending tandem much too often to make spectacular saves when they were shorthanded. They made a few, but there’s only so much a goalie can do. Vasy’s shorthanded save percentage last season was .865, the lowest of his NHL career. However, he also faced more shorthanded shots than in any of his previous seasons, which speaks to how poorly the Lightning played on the kill. Domingue’s shorthanded save percentage wasn’t much better (.870). Winnipeg Jets goaltender Connor Hellebuyck — also a Vezina Trophy finalist — had a .901 save percentage when his team was a man down. If Vasilevskiy wants to be a Vezina Trophy winner and, more importantly, win a Stanley Cup, he and the rest of the Lightning will need to improve greatly on the penalty kill. In a hypothetical situation, let’s say Vasilevskiy is struck with a season-ending injury in November. Because of the increased workload due to his absence, Domingue also goes down with an injury. 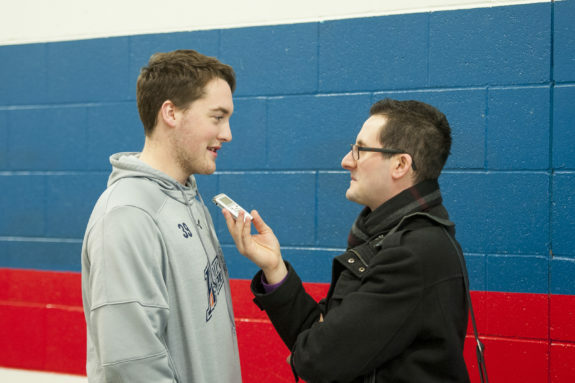 Barring a trade, the Lightning would have no choice but to call up Connor Ingram and Eddie Pasquale. Ingram is a young goalie who isn’t ready to be in the NHL, and Pasquale has been a career-AHL goalie. The Lightning would have no choice but to make a trade for a goalie with NHL experience at the very least. This would mean giving up a prospect or a current NHL player, something I believe the Lightning want to avoid doing this season. The Lightning are in a win-now situation, though, and if they want to make another run at the Stanley Cup, they will need another goaltender with NHL experience. All of this is hypothetical, of course, but these things happen — just ask Scott Foster. As a whole, the Lightning should be confident in their goaltending situation. Vasilevskiy is poised for another run at the Vezina Trophy, and Domingue will hope to provide consistency for 20-25 games this season. The Lightning will need to pick up the slack on the PK, but it should be a good season between the pipes for the Lightning.